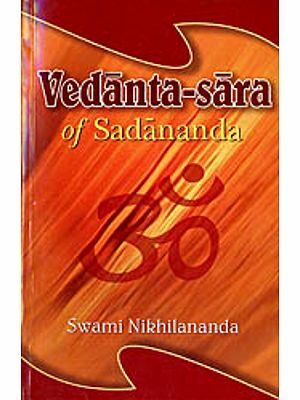 Atmabodha is a popular Vedantic treatise authored by the univercel teacher, Adi Sankara, in verse form and is a model for all teachings on Self-knowledge. 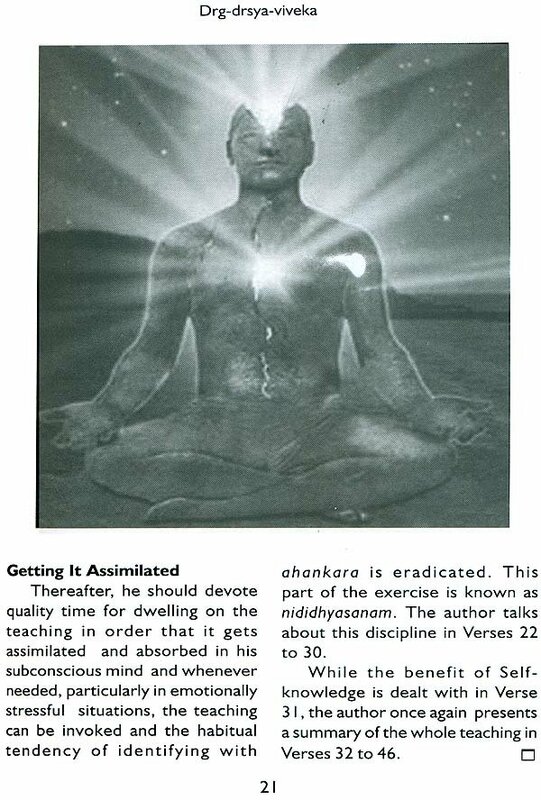 Tattvaloka has, in the course of many years, carried articles by different authors interpreting Sankara's approach. Among them is a series of write-ups by Sri. 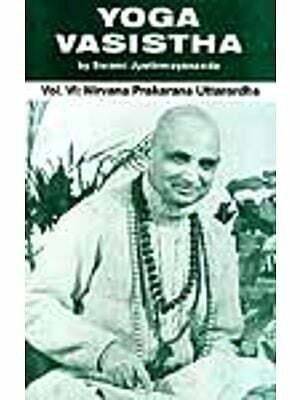 R. B. Athreya, based on lectures by the renowned teacher of Vedanta, Swami Paramarthananda Saraswati, who is based in Chennai and is a master teacher of philosophy. 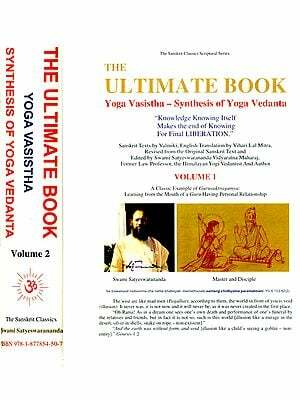 Tattvaloka is happy to bring out in book form all these articles and other vedantic texts, such as Drg- Drysa-viveka, Aparotesha Anubhuti, and Naishkarmya Siddhi. 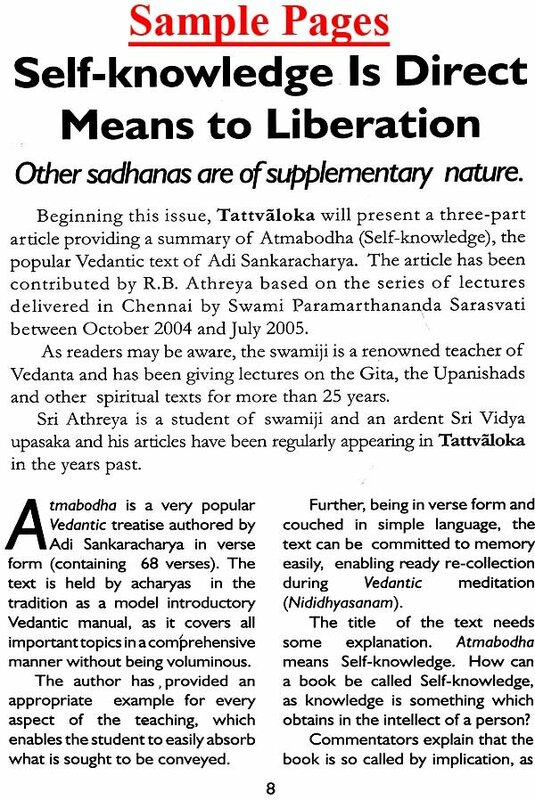 Besides interpretative articles on Upanishadic topics, Tattvaloka has been carrying articles by Sri. R. B. Athreya on smaller texts, such as Sri Rama Gita, Advaita Makaranda and Upadesa Saram periodically. 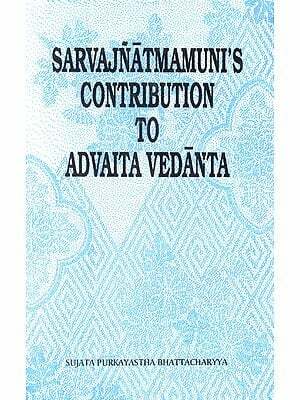 In this volume the articles have been compiled into a book form with suitable illustrations. 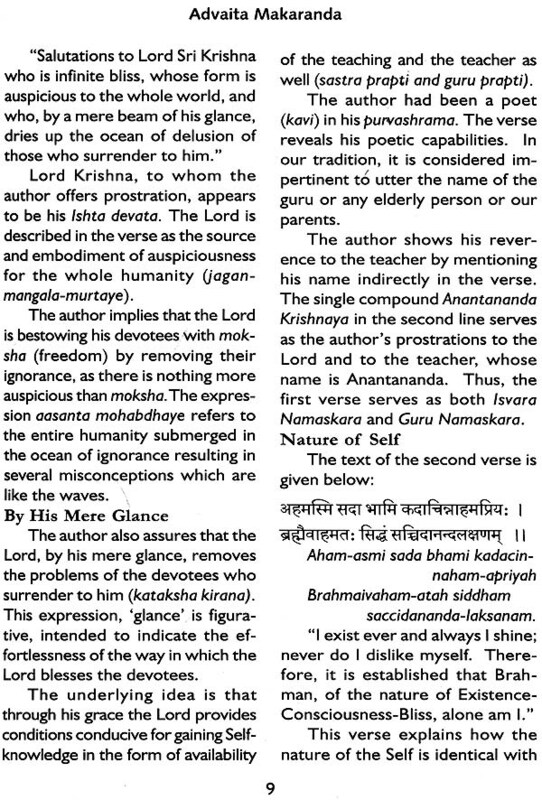 Sri Rama Gita, which forms part of Adhyatma Ramayana, is said to have been presented by Lord Siva himself in the form of a dialogue between Sri Rama and Lakshmana on the essence of Vedantic teaching. 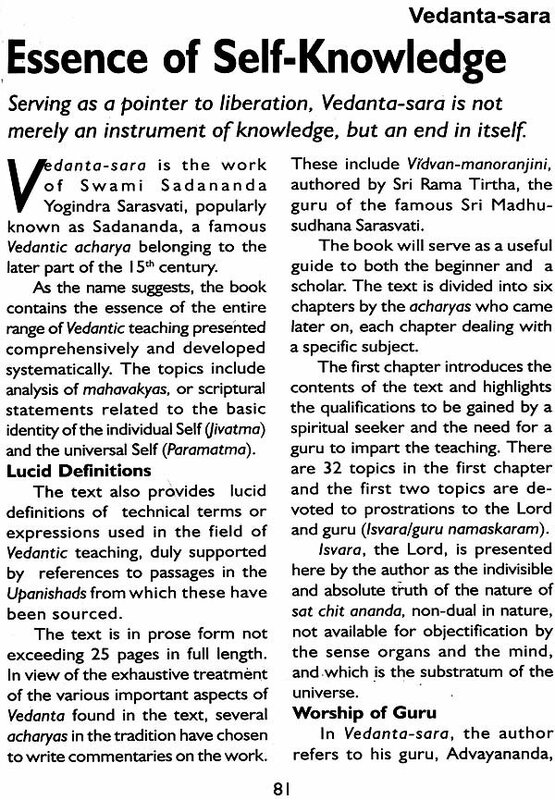 Advaita Makaranda, another concise Vedantic text, is by the Orissa poet, Sri Lakshmidhara Kavi, and is helpful for clearing all doubts in relation to Vedantic teaching. 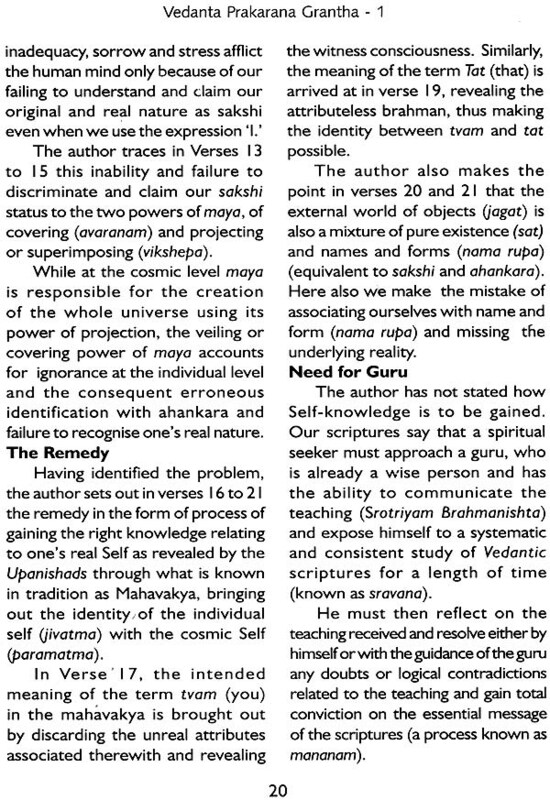 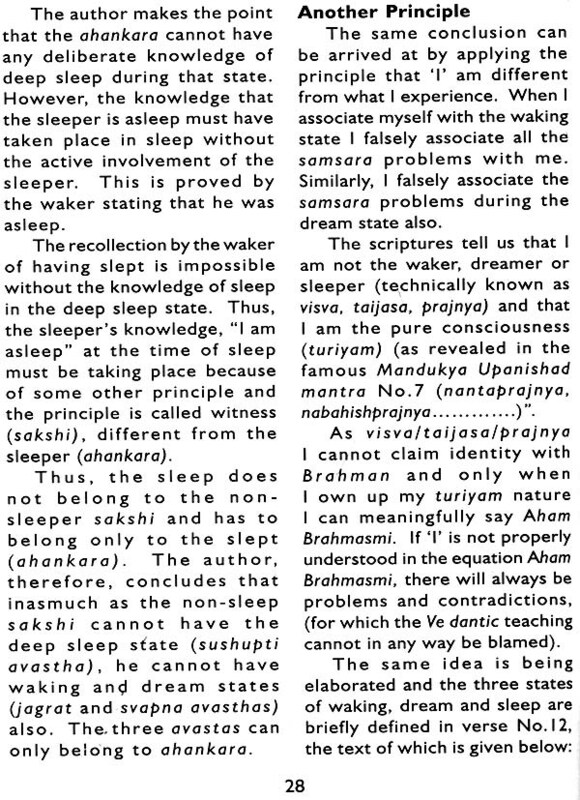 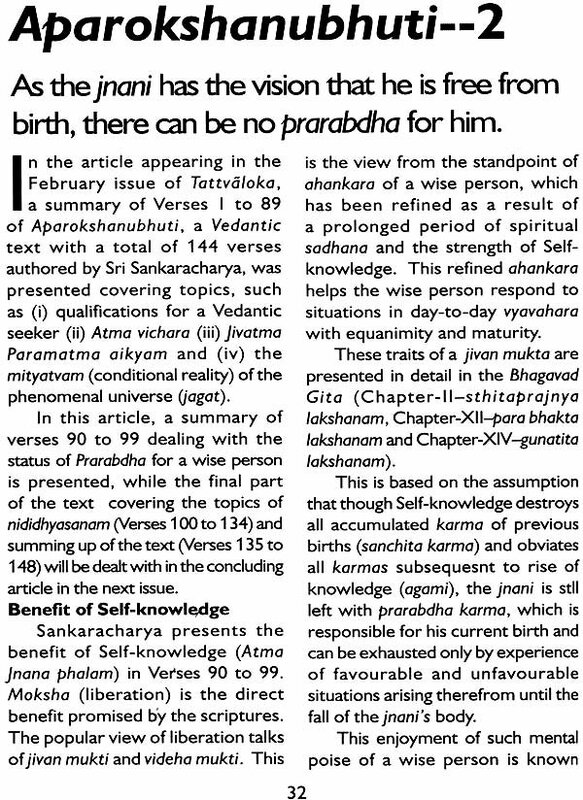 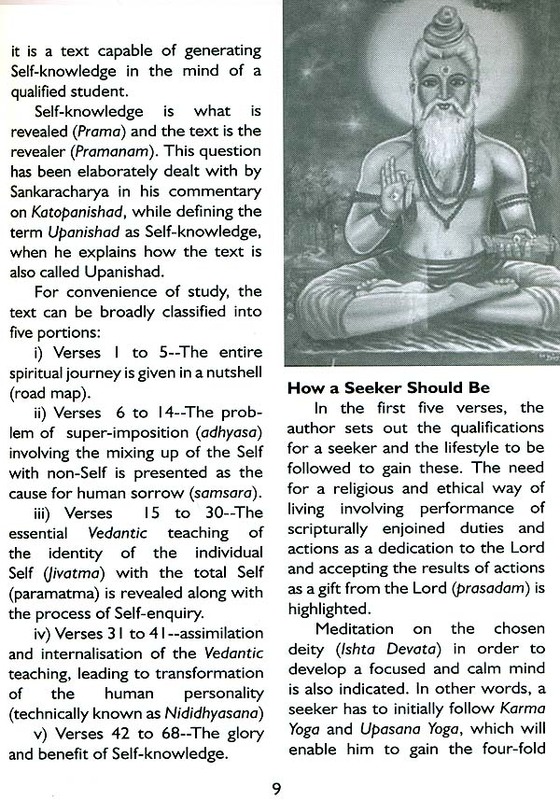 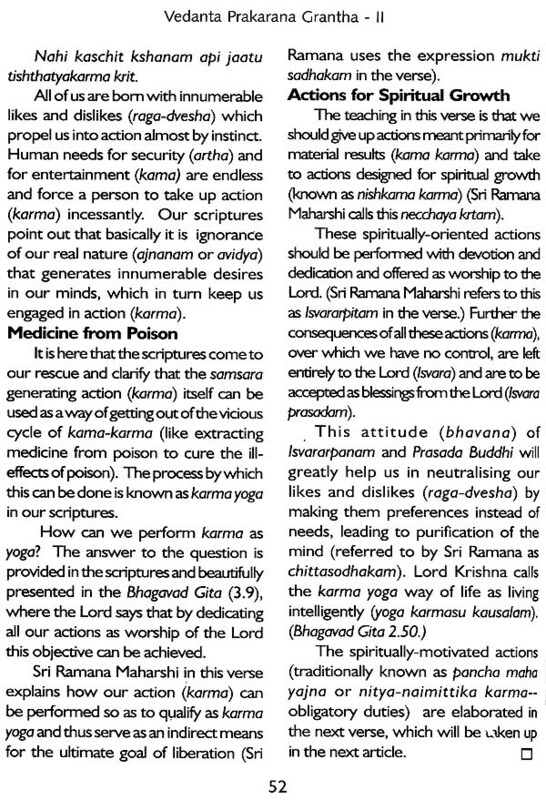 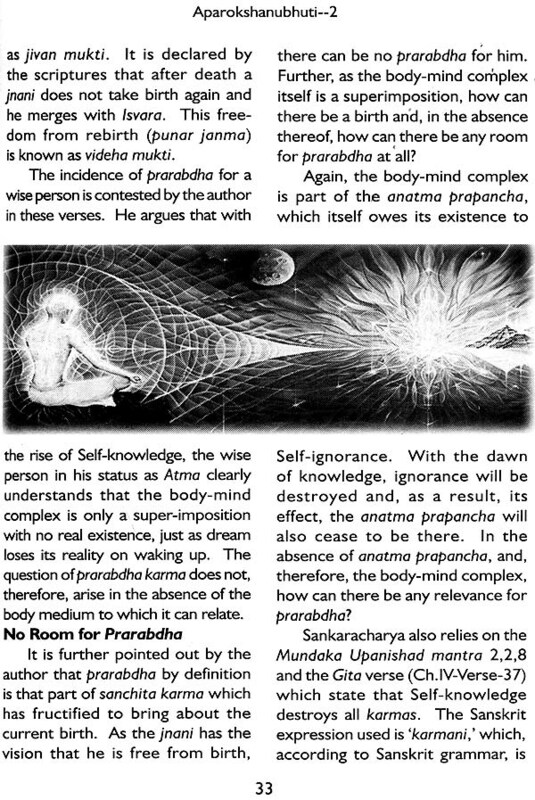 This article in eight sections helps clears the mind of all doubts in regard to Vedantic teaching. 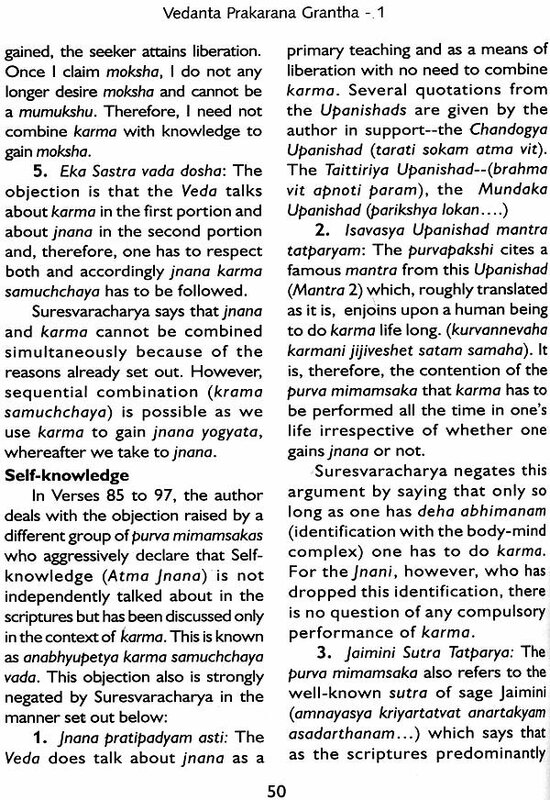 Also included in this book are articles discussing topics in Upadesa Saram, a small work of 30 verses by Ramana Maharshi. The topics relate to Sadhanas for pursuit of Jnana Yoga. 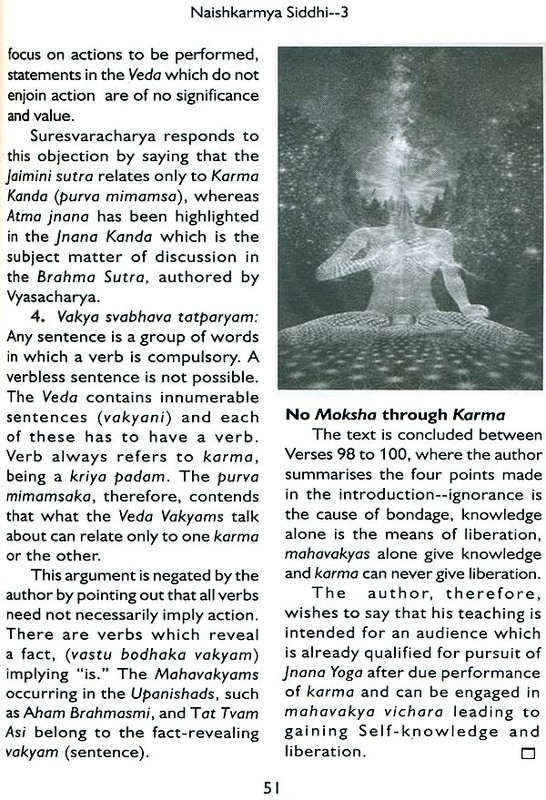 Here Maharshi dwells on the limitations of Karma and the need for pursuit of Jnana for ultimate liberation. 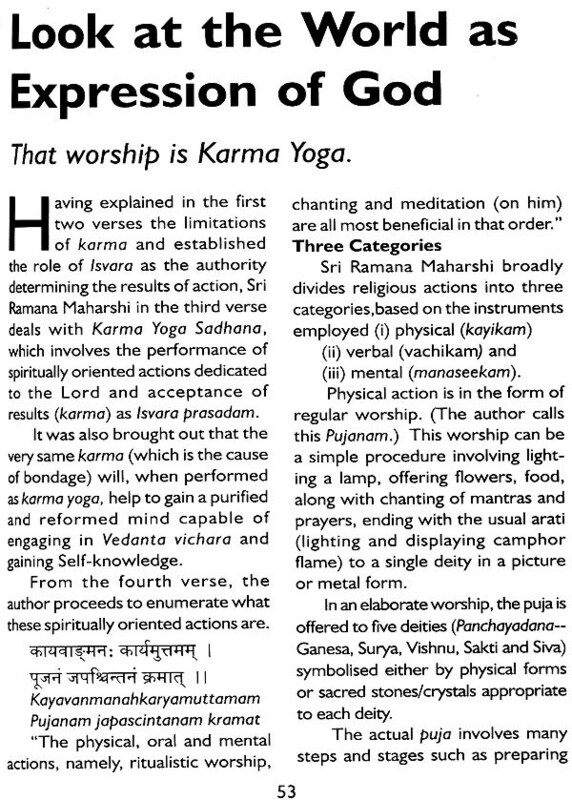 Saraswati and written in simple style.